Originally published in 1993. This book presents an amended version of R.D. 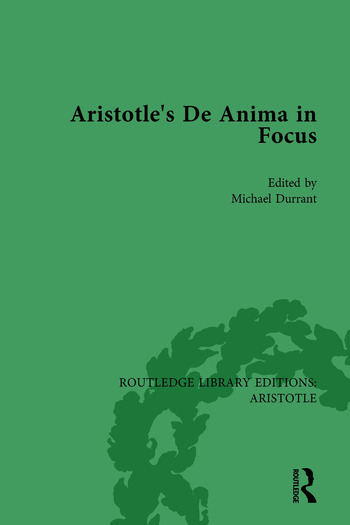 Hick's classic translation of Aristotle's "De Anima" Books 2 and 3, with pertinent extracts from Book 1, together with an introduction and six papers by prominent international Aristotelian scholars. The editor brings together up-to-date discussions of Aristotle's "De Anima", examining central topics such as the nature of perception, perception and thought, thinking and the intellect, the nature of the soul and the relation between body and soul. These papers draw attention to the importance and value of Aristotle's original contributions both to these topics and to philosophical psychology in general. They show the relevance of Aristotle's ancient classical philosophy to contemporary philosophical debate. This book also examines the key issues of Aristotle's thesis and aims to demonstrate its enduring significance. The "De Anima" is placed within a wider Aristotelian framework, and also within a more comprehensive structure, as a contribution to philosophical development and advance.